Aluratek slim USB laptop cooling Pad is a great solution to cool your laptop while providing a comfortable angled working surface. Extend the life and functionality of your laptop or Ultrabook by providing a constant even flow of cool Air to keep your system from overheating. The laptop cooling Pad supports MacBook Pro, MacBook Air, Chromebook, Ultrabook, netbooks and all laptops up to 17 inches. The cooling Pad is equipped with dual ultra-quiet fans that spin at 800 RPM to push out a large amount of cool Air. The metal mesh surface is designed to optimize airflow and helps to quickly dissipate heat that is generated by your laptop. 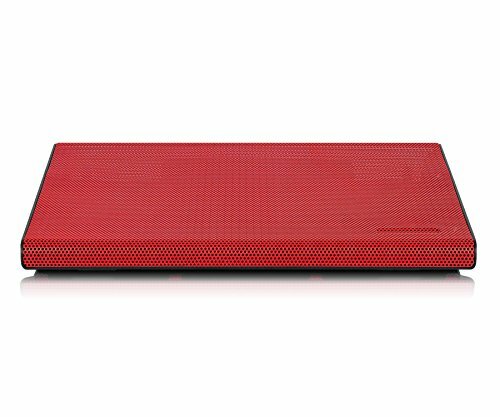 The cooling Pad is designed to be slim and lightweight while keeping its durability. You will love the Blue LEDs that illuminate the entire surface of the cooling Pad. The angled surface creates an ideal viewing and ergonomic typing angle. Connect the Pad to your laptop with the attached USB cable which includes a USB host port so you don't lose a USB port on your laptop. The cooling Pad is USB bus powered with low power consumption so no need for an external power adapter. The USB cable tucks neatly underneath the Pad for easy portability. Whether you're at home, school, or work, the slim USB laptop cooling Pad will provide your laptop with the airflow needed to keep your system running at its best.